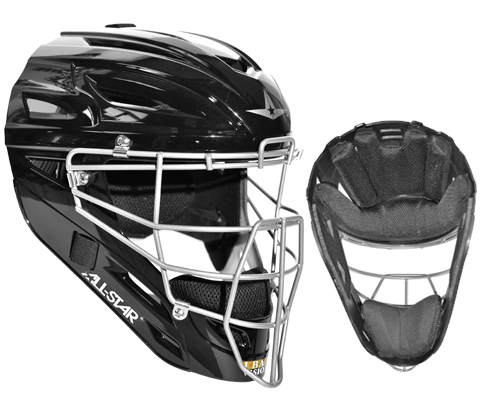 The Armor Clad™ MVP4000ti features the latest cutting edge advancements from All-Star® and A-Game Technologies®. We outfitted all of the pros with the Armor Clad™ energy control liner beginning with the 2006 season. Since then the pros have been praising the comfort and protection offered by the helmet. This same liner is also being used in the Professional Umpire's head gear. The comfort is immediately obvious. The level of protection is undeniable. 3D fabric mesh pulls in cool air and expels heat and moisture to keep athletes UltraCool™. Unlike 2D synthetic cloth that passively wicks moisture, the patent pending 3D construction transports away moisture and promotes the circulation of cool air all around the player's head. Superior protection brought to you by multi-layered, ventilated, shock dispersing technology. The lab data proves it, and the pros verify that they feel a noticeable difference when taking foul tips.